Kelly's Korner: I Heart Three Day Weekends! I Heart Three Day Weekends! Nothing too much to say today but I haven't posted a picture of Harper in a few days and the natives (Grandmas) get restless if I don't. I told ya'll I would be guest blogging for a local bank and my first post is up. You can read what I wrote about here. I'm going to be writing about 2 posts a month on personal finance from a stay at home mom's point of view. Ya'll gave me some great ideas so read and let me know what you think! Happy Labor Day! I hope you have a wonderful long weekend!!!! I liked your guest post on going to one income. Lot's of great advice. Have a great weekend! Great article with very practical advice! It made a lot of sense and I agree on all three points! GOOD JOB! Harper's a doll. Love your bank post. Fabulous article with really sound advice!! Wonderful article! I added it to my favorites to reference back too! And as always miss Harper is ADORABLE! The bank post was great!!! Good job! Have a great Labor Day weekend! Hi Kelly, You did a great job on the bank post. I hope some of the young couples will read it and take your advice to heart. As always, Miss Harper is adorable. 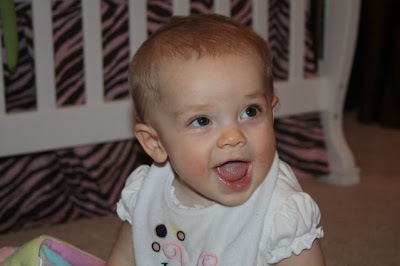 One of her cutest pictures.The bloggy Aunts get restless when there is no Harper pic, too. Have a great week end. You did a great job on the bank post. Very well written and informative! Have a great weekend! I think I look more forward to a 3 day weekend being a stay-at-home Mom than I did when I used to work!! It looks like Harper is getting more hair! She's adorable. Harper looks precious (as always!) I just read your guest post and it is fabulous! There are some great tips in there. I'm going to forward it to a couple of friends who are planning to start their family in the next year or so. Thanks for sharing! Have a great weekend. I am headed over to read your bank post. Great article! And the pic of Miss Harper is super cute! Happy 3 day weekend! WHoo! Cute pic of Miss Harper! What a well written article Kelly! I am trying to decide right now what to do when our little girl is here, I keep tossing around all three options, stay at home, part time, or full time. It's not an easy decision and you certainly have to pick the one that works for your family, personally and financially. Enjoy your weekend! Wow-zers...Thought this pix of Harper... really looks like her Daddy! :) She a doll! Loved the article! Thanks for the advice! Thank you for having such a wonderful blog. I was telling my husband about it last night, and I said, "I just feel so happy and uplifted when I read her writing." Of course, it's so much fun to read about Harper!! Thank you for all that you do. You're doing an excellent job. I liked your bank post! I hope that you, Scott, and Harper enjoy your long weekend! We used the same system and well we're still adapting and making daily sacrifices. Four kids later, really put a strain on our budget but its like you said, IT IS WORTH IT! Have a great weekend! I agree with all 3 points, except for drawing out of your emergency fund... if you're having to supplement your income, then you haven't cut corners enough IMO. We've always lived off of just my husband's income, because we knew I would be a SAHM someday. Thankfully it helped make the transition SUPER easy, and we're actually saving more now that I am home and we're on one income than when we were DINK's. great post, but i have to ask- how old are you? the post said you worked for 14 years after college, but you look my age (26ish)! great article! organized, precise, and practical in application! i'm excited to read more! Very nice post on the bank's website. You gave great advice without getting too indepth and losing the readers attention. I have never commented before and wanted to let you know I really enjoy reading your blog. You are so cheerful and seem to have such a great outlook on things. Plus, Harper is such a little cutie. I love to see her pictures. I loved the article, Kelly! I don't know that I will ever be able to be a SAHM because I am a teacher and my husband makes LESS than me... AH! But I trust that God will provide for what he wants. Anyways, I posted about you and your article in my frugal blog. It's for people near Raleigh, NC. I follow your blog & this is a song that was brought to my attention this morning & I thought it was beautiful. Wanted to share with you. Hope you enjoy! I tried to hear from Heaven, but I talked the whole time. I think I made You too small. I never feared You at all. No. How You were might to save. But those were only empty words on a page. Then I caught a glimpse of who You might be. What do I know of Holy? What do I know of wounds that will heal my shame? What do I know of Holy? Of the One who the angels praise? All creation knows Your name, on earth and heaven above, what do I know of this Love? So what do I know of You, who spoke me into motion? Lord, what do I know? What do I know of Holy? What do I know of Holy? What do I know of Holy? A great guest post for the bank:) Like I've said before, you are wise beyond your years! She is so stinking cute!! Keep the pictures coming. Great post for the bank and super cute picture of Harper!! Cool, can't wait to read what you wrote about for the bank! GREAT article. My husband and I are just starting to read Dave Ramsey books and control our finances more wisely. We are in Bentonville, visiting the family. We might be at church tomorrow, so If I see you I'll stop and say hi. Have a great L day weekend! Can't wait to read your article. I could use some new advice on money issues. Saving for Disney is a little difficult right now. What about the money you make from your blog? Do you put all of that away? Wonderful advice in the post you wrote. There are so many ways to save money these days. I live by my motto: "Make money by saving money". I wanted so bad to be able to stay home with my daughter that we made lots of plans also to make it happen. Being diligent about saving money made it seem like I was actually making money...in essence it became my job. :) Now it's more of an game/obsession to see how cheap I can buy things for. I loved your article for your local bank, esp #1. We paid off all our debt before we got pregnant (other than our mortgage.) It give you such piece of mind and although I think some would think it is not doable, with some discipline it really is, and it gives you extra money to spend on things like baby clothes :) I would rather buy a new outfit for my son than spend it on interest!